Team Skull are rapscallions who wear all black and adorn themselves with skulls. When I started Sun and Moon, I looked forward to kicking their asses repeatedly. But as the game goes on I realized that actually, Team Skull are the best characters in the entire game. Shortly after this exchange, you head over to Po Town, where Team Skull has set up shop, and it’s the nail in the coffin for any illusions about the threat of Team Skull. Sure they’ve finally succeeded in stealing a Pokémon—but it’s literally a pre-schooler’s Yungoos. Once you get to the town to retrieve it, it’s been barricaded off, but there’s a conspicuously visible path through the bushes to your left. Some members of Team Skull are holed up in an abandoned Pokémon Center and ask you for ten bucks to heal your monsters because their lights got turned off. They rap this information at you. Once you make it inside Team Skull’s mansion, they’re all having inane arguments and worrying about cute guys and girls. Even the way that you end up talking to Guzma, the leader of Team Skull, is incredibly silly. You have to answer three questions about his favorite things correctly and then when you asked if you’re sure, you have to say, “No.” I forgot to take a screenshot because I was laughing too hard. Really, the reason why Team Skull sticks together is explained by this NPC just outside of Po Town. Pokémon fans love Team Skull precisely because they’re useless losers. It makes them adorable. All I want to do is make them all hot cocoa and tuck them into their beds, or ruffle their hair and give them an allowance. 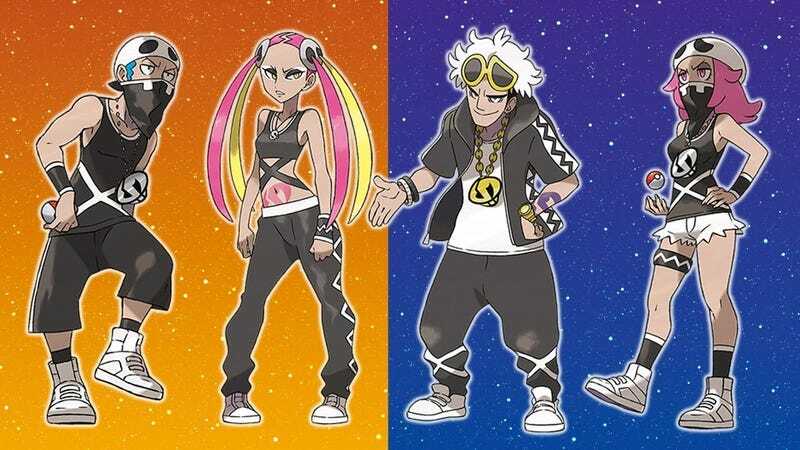 And if everyone loves Team Skull, then they especially love Guzma, the king of the dorks. The fandom has adopted, “Its ya boy!” as his informal catchphrase—he does say it at one point to introduce himself. But also, he is my boy. He is my precious boy and I must protect him.